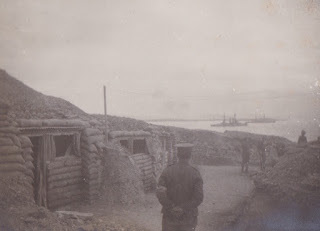 The plan for ordnance supplies was to set up a supply base on the island of Lemnos. The process of getting supplies from Lemnos to the invading troops was to be by means of two ships. The model was in a sense simple: a floating ordnance warehouse close enough to the troops to replenish supplies at short notice, but far enough away to escape enemy attack. Stores would be set out on shelving in every available space, but most particularly the cargo holds. The plan, like so many plans, proved a disaster. It was only be the inventive and hard work by Ordnance men that the troops were supplied at all.